For the American nurses who served, the Mercy Ship expedition gave them valuable experience in wartime nursing that would benefit them as individuals as well as their profession when the United States entered the war in 1917. Hopkins nurses were attracted to wartime service with the American Red Cross not only to gain new nursing skills, but also as an opportunity for travel and adventure. When the Red Cross pulled its final unit out of La Panne in 1916, Vashti Bartlett came back to the United States to serve as assistant to Clara Noyes (class of 1896) at American Red Cross headquarters in Washington, DC. After the US entered the war, Bartlett went back to France as the Chief Nurse of Base Hospital 71 from August 1918 to April 1919. 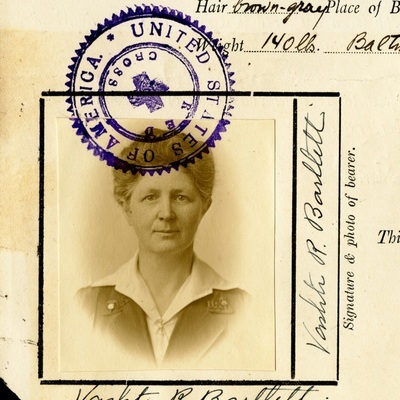 Bartlett then continued to travel and serve with the American Red Cross in Vladivostok, Siberia during the Russian Revolution (June 1919-February 1920), in Harbin, Manchuria during a cholera outbreak (August-November 1919) and as Superintendent of Nurses at the General Hospital at Port au Prince, Haiti during a smallpox epidemic (July 1920-October 1921). Bartlett’s experience was unusual for a woman of her era, yet it is part of a shared experience of unprecedented opportunity for professional activity, global travel, adventure, and new visions of womanhood available to American Red Cross nurses who served abroad during World War I. For more on Vashti Bartlett, visit the exhibit Vashti Bartlett: A Hopkins Nurse on a Global Mission created by the Alan Mason Chesney Medical Archives. Hopkins nurses also served for other countries, including Grace Baxter (class of 1894) for Italy and Amy MacMahon (class of 1903), Elizabeth Smellie (class of 1909), and C.M. Motherwell (class of 1913) for Canada.